That the Porsche 911 2.7 RS, one of the most mythical production Porsches, almost never saw the light of day is one of history’s many ironies. 1970-71 brought about the first serious downturn in sales for ten years, and Porsche’s conservative sales & marketing department was nervous about the prospect of adding a further model. They were particularly suspicious of reduced equipment models like this proposed Carrera RS, and believed they could veto it successfully. However, they reckoned without newly appointed CEO Ernst Fuhrmann. Fuhrmann was keen to make his mark and, in a dramatic scene, faced down his colleagues, shaming his sales chief by instructing him that Porsche would either sell 250, the homologation minimum, or none at all. The existence of the production Porsche 911 2.7 RS, then, is thanks to the vision of the man behind the 911 Turbo: Fuhrmann. 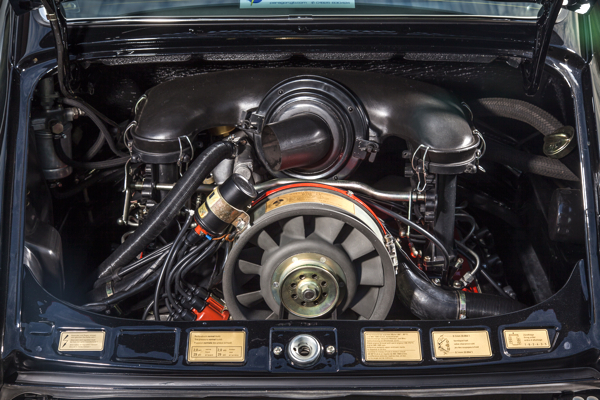 The Porsche Carrera 2.7 RS with its mechanical setup and vocal, rev-happy flat six was seen as the last of the true sports cars, and there was a strong element of ‘buy now while you still can’. It captured the imagination like the Jaguar E type had a decade before, and the initial run of 500 sold out almost immediately. Porsche had to reinstate production to build more – another 1,090, in fact – in order to meet demand. 15 years later, fashions had changed. Sports cars were wedge-shaped and more comfortably appointed than Seventies 911s, and serious Porsche racers had moved up to 3.0 or 3.2 flat sixes. The Carrera RS was at its lowest ebb in the Eighties. It was around this time in 1993 that Simon Binder acquired a black 911 2.7 RS Touring from Autofarm for around £35,000 (the RS was sold on again in 2000 to one of Sumpter’s friends). “It was in reasonable condition, original and a nice, matching-numbers car,” Mark says. One of a handful of RS Tourings outshopped in black, Autofarm had at some point painted this car white. Mark decided, though, that as the rest of it was unspoiled he would return it to its original colour. This absolute attention to detail became Mark’s guiding philosophy as Paragon systematically replaced or re-plated everything. Availability of parts was very good, and Mark was able to provide original Porsche items well over 90 per cent of the time. The Porsche 911 Carrera 2.7 RS guide price was around £40,000 according to Auto Express in 2000. How times change. The car retailed in 1973 at £5,825. To read this article (originally written by Kieron Fennelly) in full, pick up your copy of issue 106 from the Imagine Shop now. Filled with a host of awesome 911 content, issue 106 is dedicated to celebrating 50 years of Stuttgart’s finest.